Certhia palustris Wilson, 1810, eastern Pennsylvania. 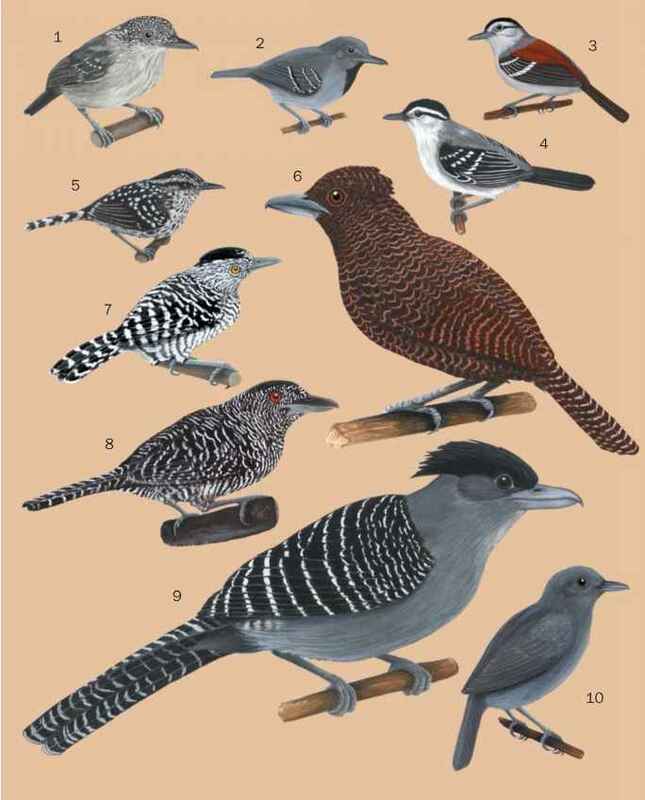 15 subspecies recognized. English: Long-billed marsh wren; French: Troglodyte de marais; German: Sumpfzaunkönig; Spanish; Saltapared Pantanero. medium-brown with broad collar of blackish; streaked white on upper back. Wings and tail are reddish brown with darker bars. Supercilium is whitish, contrasting with cap and brown eye-stripe and ear-coverts. Underparts are gray, becoming buff on lower belly and flanks. Eyes are brown; bill is dark brown above and yellowish brown below; legs are pale brown. Sexes are identical. The juvenile rather duller than an adult with reduced white streaking on back; supercilium is less obvious. 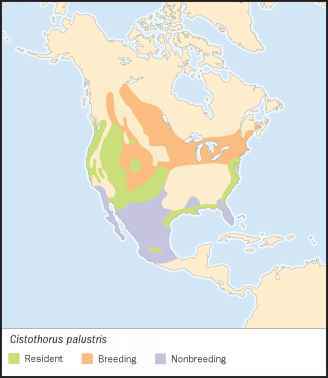 Breeds across North America from New Brunswick and Virginia to British Columbia, north to northern Alberta, south to central Midwestern states and California; also coastal marshes along the eastern United States seaboard and Gulf of Mexico. Populations in eastern and western North America may be two distinct species. Freshwater marshes with cattails, bulrushes, or phragmites; coastal marshes with Spartina. Winter migrants occur frequently in coastal brackish marshes. Active and noisy, moving rapidly among reeds, often clinging spread-eagled to two separate stems. The bird is highly territorial and predatory on eggs, both of its own species and of others, such as red-winged blackbirds. Song is a characteristic metallic rattle, sometimes uttered at night. There are many distinctive patterns of songs, with major differences between eastern and western populations. Food is mainly invertebrate, including beetles, bugs, dragonfly larvae, spiders, etc. Predated eggs may be partially eaten. Feeds from the water level to the tops of reeds, but usually stays fairly low. Exhibits two features found in many other wren species to a high degree, multiple nest-building and polygamy. The nest is a domed structure with a side entrance usually about 3 ft (1 m) above water level. It is made of strips of leaves and grass and lined with down. Eggs number three to 10, usually four to six, fewer in southern populations. They are brown with darker speckles, rarely white. Incubation is by the female, for 13-16 days; young fledge in 13-15 days. Rate of polygamy varies among different populations; may be more than 50% in central Canada, with a significant number of trigamists. Not threatened. Can be common in suitable habitat. Can reach high densities of up to 75 males per acre (190 per ha) in prime habitat. Much habitat loss is due to swamp drainage; conversely, recent water impoundments may create habitat.